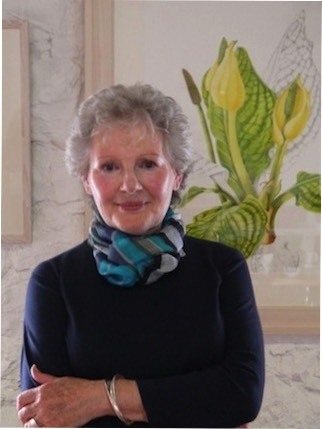 Patricia Jorgensen is one of Ireland’s most respected botanical artists who specialises in the watercolour painting of plants and gardens. Her approach is essentially narrative, to tell something of the plant’s life cycle. In this respect it is closer to that of a portrait painter than to the traditional botanical illustrator, where the emphasis is more scientific. She portrays the character of each plant while maintaining botanical accuracy. The creative expression of each plant’s personality, sensitive use of colour, and accuracy of draughtsmanship, identifies her paintings. Of note, also, is the decorative spatial quality of her work, which she attributes to early training as a textile designer. Patricia’s paintings and textile works are collected and commissioned by corporate and domestic clients in the UK, Ireland, France, Spain, Italy and the USA.